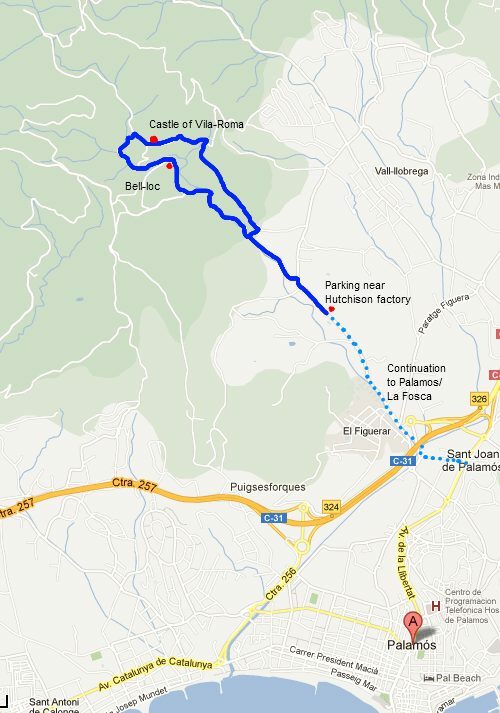 In the walk from Calonge into the Gavarres, the aim had been to reach the Castle of Vila-Roma just to the north of Palamos. The castle itself is long since ruined, but beneath the castle is the old convent of Bell-loc which has now been converted into a private residence, hotel and vineyard. This is a walk we've done several times before, but we like to do it in spring when the ground isn't so dry and the flowers and wild asparagus are starting to appear in the woods. 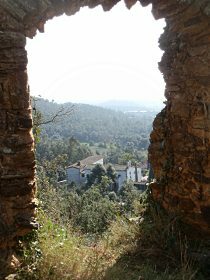 The castle itself sits above a stream and looks down the valley to St Joan de Palamos. You can see it from the dual carriageway if you know where to look, but it's very easy to miss the rust-coloured stone in among the trees if you're just passing for the first time. To reach the castle it would be an easy walk from either La Fosca or Palamos itself - there is a footpath under the new dual carriageway by the La Fosca junction up into the Vila-Roma area. Instead, we start a little closer and park just outside the Hutchinson factory which is a little incongrous to see the factory in among the fields (the company is French and makes advanced materials for things like pipes and seals and clutches among other things). Walk along the lane past the picnic area and take the signposted path to the left and into the woods. The road forks a little way along and we take the right fork (we come back down the left side). The path climbs into the woods and curls around the valley side to give the first view of the castle. The castle itself only has about one and a half tower-bits standing, so it's quite decrepit, but it looks like a proper ruined castle, albeit on the small side. Below the castle is a white building and vineyards. This is the old convent of Bell-loc which we will pass on the way back. There would have been castles and towers along all the eastern edges of the Gavarres in medieval times. To the south is Castell d'Aro. On the coast is Torre Valentino. Palamos itself was a royal garrison port, but before this had the castle of Sant Esteve at La Fosca. 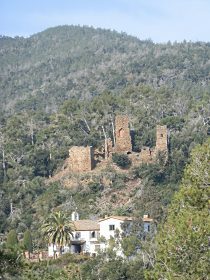 Mont-ras had a watch-out tower and there was a castle at Sant Susanna de Peralt and obviously the castle at Begur. The path continues right to the edge of the castle itself. It's relatively overgrown inside with masonery on the floor, but with some arches and windows still standing. The castle is open to explore (update: signs say keep out now) and gives views down the valley and out to sea. On the far side from the footpath, the castle stands on a bluff above the stream below (a sharp drop so watch if you're with small children). Having explored and taken a few photos we continue along the track. A signpost points to the dolmen to the right, but we continue. There are two paths from the castle both marked with poles topped with yellow in an attempt to stop mountain bikes. We take the upper path which is now a narrow track into the woods above the stream to the left. At the first left junction we turn down the valley. A sudden burst of noise and screeching brakes as a coven of mountain bikers come heading down the path. The tracks very small and bumpy but they some how manage to get their bikes down the tracks and pass with a 'Bon Dia' salutation. At the bottom is a small stream, swollen by the recent rain and we have to skip across the stepping stones to get to the other side. Then we follow the stream down through what seems like a wide river bottom littered with branches and bits of old trees as if it's a valley that gets sudden torrents of water rushing through it at times of peak rain. Underneath the castle, the path turns up and out to Bell-loc convent now hotel and vineyard. The signs outside say there is a small chapel and the people of Palamos used to come up to the convent once a year for a festival. Now it's a simple walk along the lane by the stream and past the vineyards. We see the path up to Calonge we would have arrived at if we'd continued the other walk. Finally we return to the fork and back past the farmhouses and picnic area and back to the car. 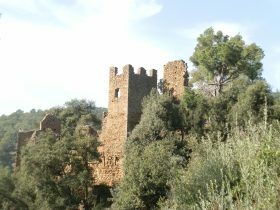 Update (June 2014): The Fire on the Costa Brava in March that we reported affected most of the area around Bell.lloc and Castell de Vila Roma with much of the woods burnt by the fire. What's remarkable is that walking in June while many trees are still black from the fire, vegetation is returning and the fire-resistent cork trees are showing foliage from behind the black-burnt bark. With much of the undergrowth and scrub having been burnt away and trees still recovering, the area is much more open with big vistas out towards the sea, particularly if you go up from the Castle to the Dolmen on top of the hill (Montagut). What's more remarkable is that in clearing the ground, the fire has revealed a hidden history. In the woods to the back of the castle, it's possible to see man-made terrace walls and the outlines of buildings that would have been in what is now forest suggesting that in the past the valley might not have been wooded to the extent it is now.